The Madhyamik examinees injured in a bus accident in Cooch Behar's Jamaldaha yesterday could not appear for the board exam today. Some of the injured students had earlier said they would write the papers today and the state school education department had made the arrangements in two wards of Jalpaiguri district hospital where most of candidates were admitted. But this morning, the candidates said they would not be able to sit for the exam because of their health condition and trauma. "Yesterday evening, after the injured students were brought to the district hospital in Jalpaiguri, some had said they wanted to appear for the exams today. Accordingly, we made the arrangements and decided to hold the test for them in two wards of the hospital. But this morning, all of them said they were unable to appear for the exams because of their health condition and mental stress," Swapan Samanta, the district inspector of schools (secondary) of Jalpaiguri, said. District health officials said yesterday that nine students had expressed willingness to write the exams. According to Samanta, the injured students have appealed to them to make arrangements for holding the examination after a few days. "We have made the appeal to the West Bengal Board of Secondary Education. A list with their names has been forwarded to the board. We expect that the board will announce the dates after the students get cured and are discharged from the hospital," Samanta said. Three Madhyamik candidates and a 12-year-old boy were killed yesterday when the bus carrying them fell into a ditch. Later at night, another examinee who was injured in the crash and admitted to Mekhliganj subdivisional hospital, Tapas Roy Dakua, also died. Fifteen students had been admitted to the Jalpaiguri district hospital with injuries. Of them, one has been referred to North Bengal Medical College and Hospital in Siliguri and another has been admitted to a private nursing home. Three injured examinees who were initially taken to Mekhliganj subdivisional hospital were shifted to the Jalpaiguri hospital this morning. "Some of the students were keen to appear for the exams but this morning, we found that they were physically weak and under mental stress as they had lost four friends. There was no question of forcing them to appear for the test. All of them are responding to treatment but they need some time to get out of the mental trauma," Prakash Mridha, the chief medical officer of health of Jalpaiguri, said. "We have sent separate reports to the Madhyamik board and to the Jalpaiguri district administration. Three examinees were taken to the Mekhliganj hospital initially. They were brought here today. They were initially ready to write the exams but later, they also changed their decision," he added. The candidates, students of Jamaldaha Tulsidevi High School who were appearing for the exam at Changrabandha High School, were returning home after writing their Bengali paper when the accident took place. Today, was the English exam. Dhirajmohan Ghosh, the centre secretary of Jalpaiguri for Madhyamik exams, said: "We visited the (Jalpaiguri) hospital today and spoke to each one of the students. None of them was ready to sit for the exam. That is why their exams have been cancelled." 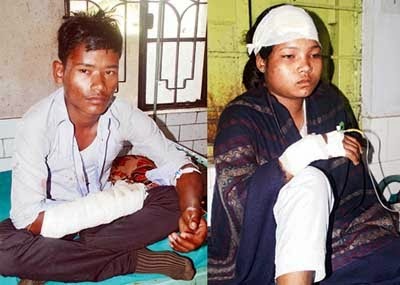 Rekha Das, an injured student, said: "Yesterday, we had thought of appearing for the test. But this morning, as I woke up, I felt dizzy and had pain in my body. I was not in a position to write the exam." Kamal Adhikary, another examinee, said he had appealed to the officials to reschedule today's exam. "We have urged the officials who met us this morning to reschedule our tests. This would save us from losing an academic year," he said from the hospital bed. All four students who were killed in the accident and all those injured are from Jamaldaha, around 67km from Cooch Behar and 45km from Jalpaiguri. The locality wore a deserted look today. Businessmen observed a strike to protest rash driving and in memory of the deceased. Later today, four bodies reached Jamaldaha as hundreds gathered to pay their last respects. Cooch Behar district Trinamul leader Kalyani Poddar and Tufanganj MLA Arghya Roy Pradhan visited Jamaldaha and met the bereaved families. The body of 12-year-old Meghnath Mondal was taken to his home in Sitai, also in Cooch Behar district, today. Poddar, who is also the chairman of the Cooch Behar District Primary School Council, said: "The state government is with the bereaved families and the injured students. All possible help would be extended to the families." Chandramohan Roy Dakua, the father of Tapas, one of the deceased examinees, said today: "I had aspired to see my son in a government job and becoming a graduate. I am a petty farmer but I always wanted him to continue studies. We are still in shock and cannot believe that he is no more with us."